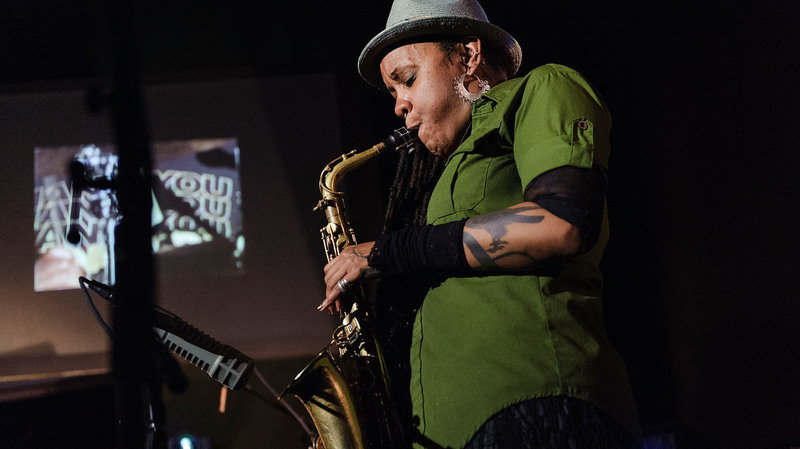 Matana Roberts' Sublime And Triumphant 'River Run Thee' On River Run Thee, Roberts immerses herself and the listener in a history of anguish, and channels it all into a magnetic unity, a postmodern opus. Ranging from mystic drone to explosive free jazz, Roberts digs into the dirt along the spiritual roots of American blues, jazz, rock and more on Coin Coin Chapter Three: Run River Thee. Consider the forest. A single tree might not look like much: bark, branches, leaves. But underneath is a dense network of roots, curling in a life-giving mass. The newest twigs are connected to those roots, reaching to the heavens while always attached to the past. And those roots intertwine with their neighbors, weaving networks of unimaginable complexity, echoed when leafy fingers intersect in search of the light. Suddenly that singular tree doesn't feel so singular, and yet also crystallizes into a unique, living entity. This duality must resonate in our collective subconscious; we even use the phrase "family tree" to honor the kinetic interrelation of life, as well as the power of the individual. That idea is encapsulated in Matana Roberts' sublime 2015 album, Coin Coin Chapter Three: River Run Thee. Ranging from mystic drone to explosive free jazz, Roberts digs into the dirt along the spiritual roots of American blues, jazz, rock and more on the album; she threads it through the pain, struggle, and beauty of African-American experience, of American experience and of her own experience. The result is something willfully messy but triumphant in its expression. Roberts has called her work on the multichapter Coin Coin series "panoramic sound quilting," but it could just as easily be seen as mapping in ecstatic detail the breadth of a deep forest. Roberts, a New York-based saxophonist, composer and multimedia artist, grew up in Chicago and flourished in the city's jazz scene, becoming a member of the Association of the Advancement of Creative Musicians and playing with the likes of founder Fred Anderson. She then moved to New York and began reaching further stylistically, from the experimental collective Burnt Sugar to appearances with indie rockers TV on the Radio. Her first Coin Coin record was released via Constellation Records, due to her connections with labelmates Godspeed You! Black Emperor and Montreal's rock and improvised music scenes. But the series, planned at 12 records, is far more than an amalgamation of these genres; Coin Coin is its own language, one rooted in the past, reacting vividly to the present and reaching for unseen futures. "I want to be linked to [the Black Arts Movement] until my last day, but I also hope for people to see my work as it sits in a certain sense of American-ness, and not just as something for Black History Month," Roberts told BOMB Magazine in 2015. While the first two chapters of Coin Coin used a full band, River Run Thee acts as a patchwork entirely in miniature, a one-woman quilt in and of itself. "The south," she coolly intones as the first words on the album — then stitches together field recordings from a trip through the American South, spoken word, saxophone, snippets of traditional melodies and haunting non-verbal moans. That might seem like an impenetrable weave, but all that history and trauma wraps around; there is no warm-up, every new vocal croak or burnished saxophone hiss unfurls into a revelation. The album becomes a womb: submerged in intoxicating darkness, Roberts meticulously pieces together the surrounding world to ensure the beautiful moments repel the constant foreboding feelings. That process befits the way the album flows: as one long river, uncontainable even by the loose boundaries of jazz and noise. It is driven by crosstalk literally and figuratively, layers and layers of intersection causing deeper resonance — but, at times, also conflict. Passages from a slave trader's journal intermingle with the tenet of Malcolm X's "Confronting White Oppression" as though in conversation with one another, or reacting to the turn of the dial on some inter-dimensional radio. The swarm of trance-inducing noise is weighty in its depth of meanings, as much traditionally spiritual as it is transcending any and all tradition. There's no single point of focus, no place to hold on, no space to catch a breath, and yet it sinks into the bloodstream and becomes a fuel. The clot of analog synth, saxophone and moaning channels the ache of the slavery era, a lucid phrase or melody expanding to deliver a spiritual release from the weight. Though the pains of the past often decay into mere fragrance, Roberts breathes them in and expels them through her saxophone. The instrument howls full of cracked earth, her voice an idiosyncratic vessel capable of soaring and souring in equal measure. But it's pain that makes Roberts boundless. "There was a period of my childhood where I tried to contact people on that [spirit] plane," she recently told The Quietus. "I realized that music is my medium, my guide." Through River Run Thee, Roberts grabs hold of our spirit and drags us through the deep curtains of sadness and generations of pain, in all their complexity and capacity for challenge and change – and becomes an unrivaled power that inspires you to fight alongside her.